The scientists and researchers concurred that playas recharge the aquifer at the rates described in the USGS Recharge Rates and Chemistry Beneath Playas Literature Review (Gurdak and Roe, 2009), which is about 3 inches per year, on average. While they agreed that this rate was not fast enough to counter the amount of withdrawals due to irrigation agriculture, they also agreed that the amount of recharge could support a small family farm, a rainfed (or dryland) production system or a grazing system. They also recommended recharge through playas be incorporated into water conservation plans for municipalities that depend on the aquifer. In addition, the benefit of a healthy playa —a playa with a grass buffer and no hydrological modifications such as pits or ditches — goes beyond simple recharge. The water that reaches the aquifer through playas is cleaner than water that enters through other channels, such as through upland soils or from around center pivot wells. Playas are wetlands and thus provide the same water cleaning services as other wetlands. Sediment, and the attached pesticide contaminants, are removed from water flowing overland through a grass buffer. After the water reaches the playa basin, denitrification occurs with the help of soil bacteria. The result is high quality water reaching the aquifer that can then be used by those living on the land. As part of the Summit, a number of communication messages were discussed and vetted by the participants. PLJV then developed messaging that can be used by the Joint Venture partnership and those talking about playa conservation. The full report and a tip sheet on communicating about playas and recharge are available as part of PLJV’s Playas & Recharge Communications Kit. 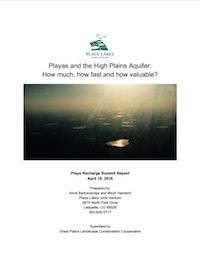 The downloadable zip file also includes the USGS Recharge Rates and Chemistry Beneath Playas Literature Review (both the executive summary and full report) and a Playas and Ogallala Aquifer fact sheet that can be printed and distributed. Learn more about the Playa Recharge Summit and download the Playas & Recharge Communications Kit. The Playa Recharge Summit was funded in part by the Great Plains Landscape Conservation Cooperative. Participants included 14 scientists and researchers who study various aspects of playas — including hydrology, wildlife ecology, economics and communications.